This Sunday workshop is an informative and interactive workshop for short-story lovers and writers. Gain insight into the short story genre by learning to identify its major tenets, plus learn and participate in a discussion about how the elements of characterization and point-of-view, plot and setting work in the form. Read and discuss excerpts from the work of popular short-story writers, and uncover how these authors have incorporated these elements in their work. The morning will be spent learning about and discussing short stories, plus responding to various prompts to get your creative writing wheels turning. In the afternoon, you will participate in more targeted creative writing exercises to help you devise a basis for your own short story. You will also be given a week’s worth of prompts, 1 prompt per day, designed to help you remain motivated to work with your short story and the characters you’ve created. This workshop is open to fiction writers of all levels and it works for everyone! 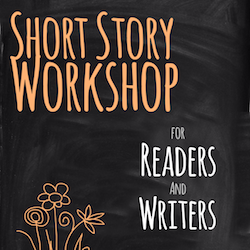 Note: Each participant will receive links to two short stories that should be read prior to the workshop. Please print these stories, bring them with you, and come prepared to discuss them. Other handouts will be provided at the workshop.